1983 242 Turbo Flatnose "theory"
I wasn't sure where to put this so it gets put here. Move it if it needs to be moved. I've always wanted to have this as an open discussion to hopefully fill in some of the blanks, but rarely is someone qualified enough to do so. This is something I wrote up for a racing forum I stumbled across by accident and they were discussing older Group A race cars. In this conversation the "Flatnose" homologation cars came up. I think it's a good place to start the discussion and see where it leads. Please only post actual information or at least somewhat know what it is you are talking about. Thanks. There are MANY rumors about the homologation cars. From all of the people I have talked to and the miscellaneous information I have gathered over the years I would say that they are mostly that... rumors. The rear wing may have been in the trunk at best. A usually very reliable source that was there says they were all outfitted to some degree and then after receiving the approval papers were then stripped back to normal road cars. The part that has always eluded me is if it was the 500 or 5000 car rule that he is referring to. My theory is that they had 500 non-US cars that cosmetically looked the part but mechanically were just normal road cars with a few key visual parts changed. After approval they stripped the race parts and returned the majority of them to regular road cars and saved a handful for racing purposes. These were the first 500 required to get approval. The 5000 required to get the 2nd approval (Sorry, I forget exactly what each approval was for) were the cars that actually came to the US and were sold over here to the general public and are what are now commonly referred to as the homologation specials. Volvo enthusiasts often call these cars "Flatnose" Turbos, Group A Turbo, "Homologation Special" or some combination/variation of those names. When in fact all they really were was an intercooled Volvo 240 Turbo with a different (non-US) grill and hood. These are the cars that have all the rumors surrounding them. I have owned 4 of them, my co-worker currently owns one and I have inspected countless others for friends and other enthusiasts and they are physically not any different than a normal intercooled 240 Turbo. I have owned (bought and sold) over 600 Volvo 240's in the last 15+ years, so my knowledge of this paticular car in general is very good. These cars may have originally had the older E-code rectangular lights that match the grill, and had to be removed for US DOT approval to be sold here in the US. That would explain why they have a strange grill, they (from a distance) would resemble a european 240 Turbo then. However, the true european 240 Turbos and the real Group A race cars all had different front end sheet metal than the US spec cars. We recently converted my co-workers homologation special to the european 240 Turbo style sheet metal (same as 86 and newer US spec) and although it's a relatively easy un-bolt and bolt back up process, I can't see Volvo changing out 500 cars that way like I have been told by Volvo employees. Last edited by Tuff240; 03-22-2006 at 09:04 PM..
excelent write up, this should be stickied or saved. i talked to a guy down here who has one of those rare flate nose 242 turbos and he wanted $5,000 for it. You guys already know what i know... just add that with all the cars pat and I and others have seen over the years added to the mystery and rumors that grow/change each time they're told... a 5000 number is much more realistic. Well, I've been reading about homologation for Group A and they just need to be sold worldwide, because we NEVER received a 242 Turbo and yet they still raced the car the years that Group A reg's required the cars to be closely related to the road car (85-86), as far as the engine went, but we also are a RHD country and they did sell a Turbo engined model, I would've thought they jut needed to sell 5000 242 Turbo's, then the 500 had to be a lot more closely related to the race car. This is a good discussion. I have seen many cars advertised as one of the 500 but it sounds a bit fishy as I dont think there should be that many still around. Does anyone know the number of total 240s sold in 1983 and how many of those were turbos? 5000 flathoods sounds a bit too high as well. I just sold my original 1983 "flathood" turbo two weeks ago, I have owned about ten different 240 turbos and this car was hands down the fastest all-stock car of the lot. Does anyone know the number of total 240s sold in 1983 and how many of those were turbos? 5000 flathoods sounds a bit too high as well. Volvo's production figures for 1983 say they made 12,893 242 bodies. The books I have do not break that down by engine, so no idea how many were Turbos. Number taken from the book "Volvo: The Cars-From the 20's to the 80's" by Bjorn-Eric Lindh. I also have one of the Volvo yearly retrospectives from the late 80's which gives the same number. Wasn't there a VCOA registry for the 83 "flathood" 242's? Anyone contact the maintainer to see how many he has on that list? Read in the paper,just last week that close to 75% of all production Volvos are estimated to still be on the road, so it may be possible for one to show up now & then. 1987 760TI A Cam, Hydras 90+ turbo @12lbs. From my understanding, the original 5000 car homologation was done before 1983, to generally qualify the 240T for Grp A competition. It required the company to prove they produced at least 5000 of the 242 Turbos, so it would be a true competition between road cars from all manufacturers. Maybe a true worldwide market was not as important. The 500 cars came along in 1983 as a separate evolution special of the original homologation, which allowed a little more in the way of race-type parts to be used, such as a larger turbo, larger all-aluminum intercooler, 8 port fuel injection and of course the water injection. This is where all the controversy came from, because competitors called B.S. on Volvo when they could not find any real-world evidence of the so-equipped cars existing outside the race cars. The pressure built until FISA officials flew to the US to inspect a portion of the cars and somehow judged that they were equipped as claimed. 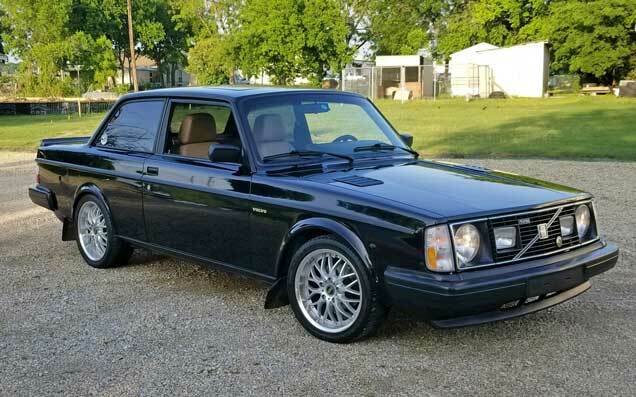 Is there any wonder why Volvo never separated the '83 special edition in any advertising back then? I have heard stories of people buying these cars new and never realizing there was anything different about the front end until later. Maybe Volvo was hoping (and praying) they would blend in with the thousands of other 240 Turbos being sold. I did get a chance a couple years ago to covertly converse with a couple people from Volvo (allegedly involved in their racing program back then), who were *very* sensitive about ever being identified. They would not discuss the possibility that Volvo fudged on any specific FISA rules, but one did tell me that all racing programs "pushed" the envelope as far as they could or they just weren't competitive. Some stretches were found to be legal, some were not. That simple. All of the truly competitive teams had controversies. Volvo's just made more news than the others. But any hint of an inquery I made into the possibility that the 500 evolution cars were never actually equipped as required resulted in an immediate and prejudicial comunication shut down before I knew it. 1. The race cars were non-sunroof cars. All US '83 flathoods I know of were equipped with sunroofs. 2. The race car platforms were all "Euro" edition types with later front fenders and lighting. I do not believe the Volvo factory ever equipped these '83 cars with pre-1981 e-Code lighting and then removed that lighting. I believe the cars made into race cars were specifically selected or built by the factory for that purpose and probably never saw the light of day with any road-car equipment. I believe the reason Volvo chose to put a flat hood on a 1983 US model was that the hood was a specifically homologated part for better aerodynamics and they needed that hood to be on whatever car they chose for the 500 unit run. They could just have easily chosen a Euro version 242T for the 500 units, but I guess we'll never know for sure why they didn't. Bottom line... the 500 or so '83 US flathood turbos have a wonderful historic value, but (equipment-wise) were really just 242 Turbos with a different hood, grill and VIN plate. Last edited by dbarton; 03-23-2006 at 07:26 AM..
What a great discussion on this particular topic..hopefully it will put it all out there for a final understanding of what "is" and what "is not". Love the picture choices as well. SIX HUNDRED CARS? Holy **** man! Are you super ultra rich from doing that? I currently own 3 1983 Original Flathoods. and Silver (purchased in 2003). The silver car had the original window sticker in the owners manual (lucky me). The cost of this car in 1983 was $18,465 and I can forward a jpg of the sticker if anyone wants a copy. I have restored all three of these vehicles and there appears to be nothing special on these vehciles other than the hood and the "Silver" grill that came on European models (in black trim) until 1980 when European model's front sheet metal more represented US 1986 and later models. None of my cars have/had bigger intercoolers, bigger fuel distributors, group A wings, limited slips, water injection etc., upper or lower braces when purchased and any Rsport shocks/struts were most likely replaced in the 17-20 years prior to me. All were automatics and intercooled, had 23mm front 21mm rear sways and came with the Turbo + system. In my treasure hunting of the greater Los Angeles and San Diego Ecology (which are U pull it yards), I have seen only 3 sent to dismantling in the past 6 years but have seen hundreds of regular 1983 242s sent to the yards. My guess would be closer to the 500 production number with each dealer only getting a certain allotment if any this is based on the following: junk yards in SoCal are incredible and it is typically for each of these yards to have 20-30 240s at any one time with inventory turning approx. every 4 weeks so you can imagine that they must process 1000s of 240s a year collectively. So to have only run across 3 in 6 years must put the number sold at a very small amount. The passenger's side strut tower has a special serial code denoted with an S02476 (for those of you who believe you have an original car but not this stamping on your strut tower I have no answer for you and will not dispute anyone who says that not all Flathose came with this stamping). I spoke with a gentleman in San Diego who purchased his flathood in December of 1983 in Arizona and never installed the Group A spoiler that was in his trunk and came with the car. He left it in the box in his garage and there it sat until the San Diego fires in October of 2003 got to it (very sad). The original spoiler was manufactured by Richard Grant (a U.K.) company and I had the priviledge of purchasing an NOS one a few years ago which I have installed on the black car. Since that time, I have tried to track down more of them from suppliers in Germany, UK, Australia with no luck. I do have a copy of some of the original international paperwork submitted to the racing authorities for the 240 model. For me personally, owning an original 1983 flathood is gratifying in the fact that the cars are rare and unique. Are they that special, well most likely the answer is "no" but then again I am biased. As mentioned above, I am selling the black one which won 3rd place "stock class" at the 2002 Solvang meet. Serious inquiries only. Not sure if any of the above is pertinent to the discussion, but I will keep reading new threads and hopefully I can answer any questions based on the above. Okay, I am gonna post this and you guys can delete it if you want to. I didn't know much about Volvo history when I got this car. In fact, at first I had no idea that there wasn't anything right about it. It was a "1982" 242 GLT (on the title) with a production month of September 1982. It had been wrecked in the front and possibly had a new front clip (someone actually spent good money having it done because it was hard to tell it was wrecked). It also had turbo swaybars, vented rotors the 'orange' struts and for all practical purposes was a turbo car without the turbo. The kicker is that it came with the LH 2.1 fuel injection system (still not 100% that this is what it's called). It had the 001 AMM, electronic fuel injectors (ala Saab) and no TPS switch. It also had that pressure switch on the firewall just like the turbos cars (still don't really know what that thing was supposed to do). ^^^ sorry to post this here. But, I have always wondered why this car was equipped in such a way. BTW, VIN was validated as a GLT (not a GT) delivered to a dealer in Virginia in late 1982. Well hmm here's a strange one. How is it that I found a Group A wing on a 242 abandoned in a guy's yard. It was a strange car with most of a GT interior and some sort of weird lightweight rims that he said were metric. Answer: Pure luck (I guess). "The one that never existed" lives in my mechanics garage and is being restored to rally racing trim. It took the 1991 (or maybe 1992, 1993) SCCA Group A Class Pro-Rally Championship. It was actually built out of the spare parts generated by dismantling some of the 500 cars. It was never issued a VIN. It was shown publicly at the New York Auto Show when it was made, but the showing was cut short when the then President of Volvo (the big Volvo in Sweden) informed the VPs who had built it that "Volvo does not make race cars," and that he did not want to ever see the car again. Somewhere, I have the contact information for one of the VPs who was in on the US build. My mechanic used to have the original FIA Group A homologation papers. Clay and I also have the homologation papers. They don't explain a lot, but just show diagrams and images and dates of specific parts approved by the FISA for use in Grp A. Curious about your friend's car. I'm sure we'd all like to see pics and hear more. So... was it built from an '83 US version 242? ...With a SUNROOF? Was it built by Volvo engineers or by an outside contractor? I still doubt any of those 500 cars were "dismantled." I could be convinced a few cars had race parts for FISA's sake, but not many. That's what Volvo told the FISA. Maybe they bought it, but common sense says otherwise. I have 2 of the 83 242 flatnoses in the shop. Both were made in Belgium, and both have the SO2476 # plate. Both of them are 4sp/od, and both have sunroofs. Both had the decarbon front struts although they could have been changed. I have seen no difference in them from a stock 240 series turbo execpt they have an i/c and boost plus system. I know of a car in sweden that was for sale that supposedly was one of the first homologation cars .. it had been sent back to sweden from the US. It sold before I could see it , but I still have the pictures the guy sent too me It had m51 , all aluminum intercooler and the water injection system. It was also a sunroofed car. I was emailing one guy that had looked at it and he didnt like that the front fenders had been repainted. I think someone had swaped the euro-front to it since it was a US spec car. This is hear-say, but supposedly only the first shipment of 50 homologation cars with the grpA parts was inspected thoroughly. After that "some" parts were placed in the trunk ,, then not even that. The first group of cars with the installed parts were immediately sent back to Sweden. Last edited by NoSloVo; 03-28-2006 at 12:27 AM..
Southern Cali is a mecca for junked 240s. Last year I stumbled upon a black 242 turbo in San Diego. It had the flat nose front end and the grey flat nose grille. it did not appear to have been converted. It has a sunroof and it was auto. It had the turbo plus system. I took that and the grille as the car was kinda beat. Not bad for $20. Turbo Plus system on the 83 cars? I doubt it. To the best of my knowledge no 240 Turbo ever got the Turbo + system, even as an accessory. Turbo+ was only listed as an accessory for 700 series cars. What the Intercooled 240 Turbos (including the 83 flathoods) got was called the "Intercooler Boost System". It was basically an RPM relay, solenoid, a couple relays, and a large amount of wiring that served to raise the boost level from the non-intercooled 6.5psi to the intercooled 10.5? psi at engine speeds above 3750RPM. All the 83 flathoods should have that, but it was a part of the intercooler package, not an extra feature of these cars. Different system, same name. The 240 had it, just not the "it" that the 7's had. I've worked on a few of these 83 flathood cars and the only special parts I've noticed are that the intercooler design fan shroud is different than the later production version and they seem to have a flat flywheel clutch that can hold upto an intercooled cars torque. I'll check my friends for the stamping on the strut tower. Overall any of the model year 83 2 dr turbos could have been ordered with the Intercooler trim package and sold here. The five hundred were needed for homologation but that doesn't mean US dealers didn't order a lot more than that with the package.